Misrad HaKalkala is warning the public that the following costumes do not abide by the Israeli Standard for toy safety because they were found to be flammable. For those who were interested, there is a new page with all of the Pesach lists. I will add more during the year. Feel free to send me any of your tools- I would be happy to post them as well. Now, back to mishloach manot. For the little kids, these bags are a lot of fun, both in the making and in the using during the meal. There are lots of ideas for what to use- these are our favorites. Each child makes their own (older kids) or make them yourselves for the younger ones. Have them look in the bag for each item as it relates to the plague you call out. Tomorrow is Purim Katan and Yom Ahava- also known as Valentine’s Day. That calls for a celebration! Normally I start the pre-Pesach missions on Shushan Purim. This year we have an extra month to prepare and be relaxed about it. I especially need the extra time this year- I will be out of the country for a week in March and have a big project due around that time. 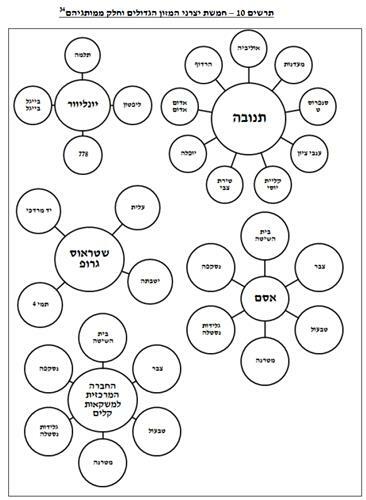 The point of the Pesach missions are to help you get organized. How does being organized save money? By being organized, you are prepared. If you are prepared, you can purchase Pesach foods when prices are low and you have time to cook healthy food instead of running out and buying expensive takeaway. Back to the mission. Your Purim Katan mission is to open your closets, refrigerators and freezers. Take an inventory of your chametz. If you don’t already have a theme for your mishloach manot, see if you can come up with one based on the chametz you have in your house. If you have a lot of flour, you can make mini challot or muffins. Too much cereal? Buy a nice bowl, put cereal in a bag into the bowl, add a spoon and a small carton of UHT milk for a cute kids snack. For some reason, I have a lot of falafel mix in the house, so a good mishloach manot would be homemade pita, falafel, chumus, a tomato and a cucumber. The point is not to shove your chametz onto someone else but to take what you have and make it worthy of a gift. You might notice that my suggestions don’t include junk food. We really don’t need it and if you have kids, you will get and give plenty anyway. I don’t know about you, but I am running around like crazy doing all the things we do on Purim and I never have time to make a quick healthy meal. Therefore I am grateful when someone gives me a mishloach manot like the ones listed above (which are all real gifts I received over the years). If you have any other suggestions, please let me know! For more ideas, check out Kosher on a Budget’s list of 101 Mishloach Manot Ideas. In addition, most (if not all) packaged fresh meat is already KLP. Those who do not eat kitniyot will have a much harder time finding KLP products early, just as you do right before Pesach. It seems that the companies prefer to write that there might be kitniyot because it is easier than ensuring they don’t. 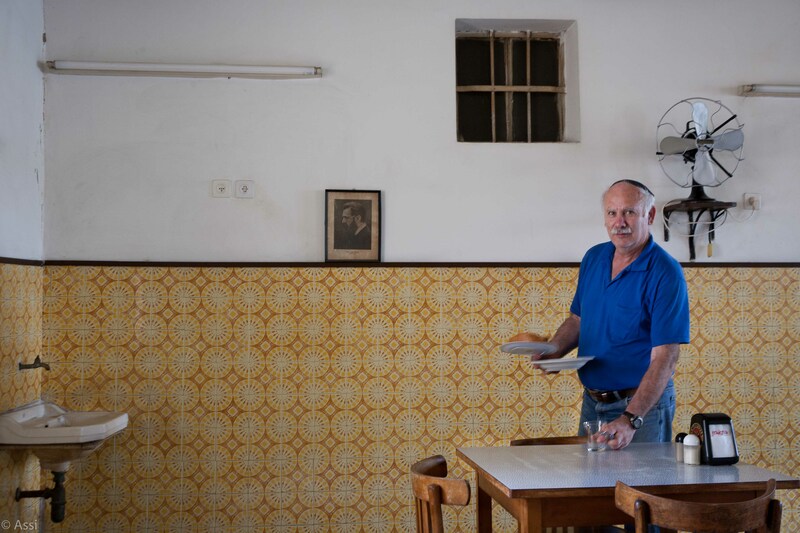 If you always wanted to be Sephardi, are not too attached to the kitniyot tradition or are just curious, I recommend you check out the Kitniyot Liberation Front Facebook page, blog and articles written about them. Their argument is more about Jewish unity and less about kitniyot. The other thing to keep in mind is that there are only 8 1/2 weeks until Pesach. Now is also the time to STOP buying chametz that you won’t use up in 7-8 weeks. If you plan your dinners in advance, figure out when to serve those 8 packages of corn shnitzel or 12 bags of pasta. If you can’t do it without a revolution on your hands, donate the extras now. If you can’t wait until Shushan Purim for the first mission, click here. 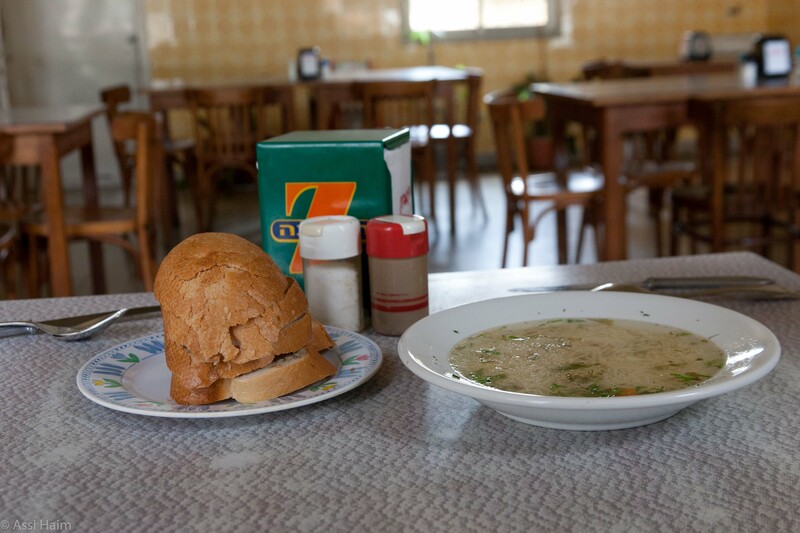 This restaurant sits in a small spot overwhelmed by Kvish 6 and a large intersection which makes it difficult to get to. 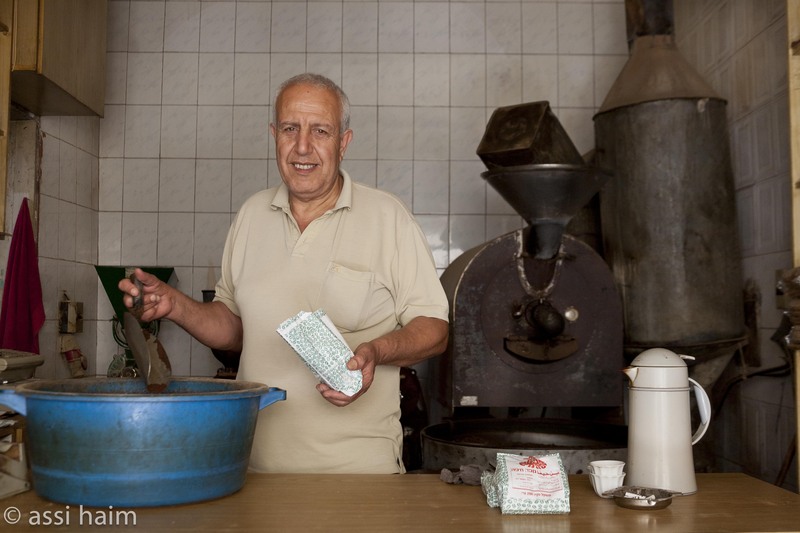 In the old days, Mordechai supplied blocks of ice, kerosene, needles and baking soda to clean out the heaters. There were many hard times, but the hardest of all was not being able to satisfy the hunger of his customers during the siege of the Old City. 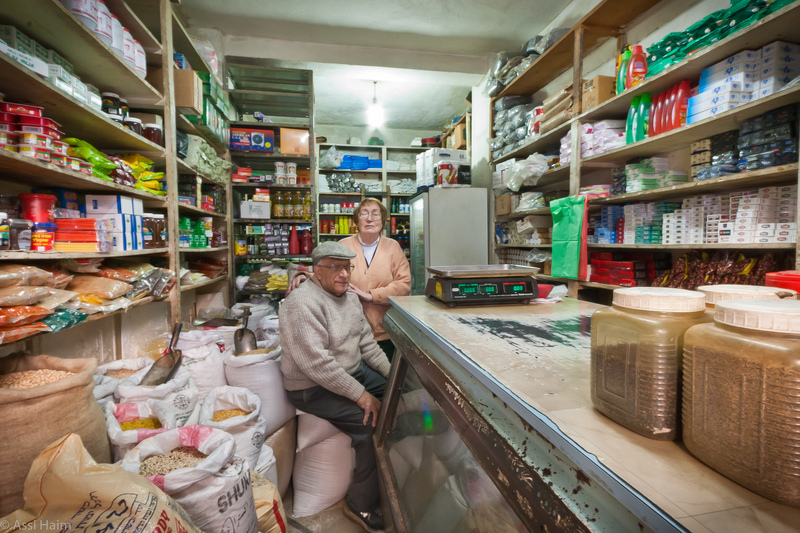 Today his shelves are full but his customers now prefer to shop in the supermarket and Mordechai and Sarah begin to realize that they too are part of a forgotten world. Go to “HaMordim” for more pictures and stories. 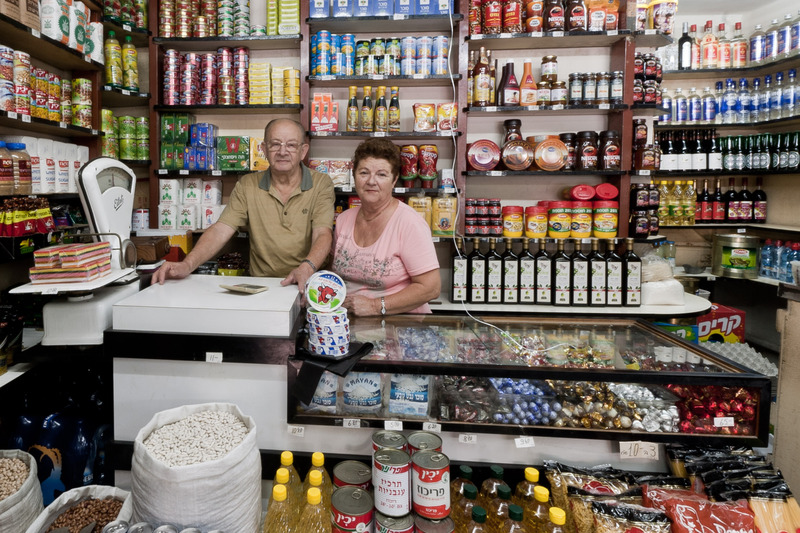 In my previous post, A real look at the price of food in Israel, I discussed the relatively high prices for food and other commodities in Israel as compared to OECD countries. The information presented in the report was used as the foundation for creating a new law entitled Promoting Competition in the Food Industry-2013 which is still a proposal. The instigation for this new legislation was the Kedmi Report on the Food Industry of 2012 which outlined several methods to lower prices, including lowering import taxes, preventing suppliers from purchasing retail space and stronger enforcement of consumer protection laws. Since that report a new government was elected and therefore some of the recommendations did not make it to the proposed law, such as lowering import taxes and strengthening the Consumer Protection Agency. The three main areas the new law deals with are: (1) Regularizing the activities between supplier and retailer, (2) Strengthening competition in certain geographic areas and (3) Strengthening price transparency. Limiting market volume from the manufacturing end (a monopoly in one sub-industry can not be in other sub-industries as well) in addition to the retail end (limiting the market on a national level and a regional level). Active encouragement of the growth of small and medium-sized businesses. Encouraging the activity of private brands in the market volume through subsidies, research comparing the quality of different brands and advertising the results of the research. Creation of a body that will be responsible for collecting information, checking that the promotion of new legislation is progressing, following the lowering of prices and publishing an annual report of its findings. When this law starts moving forward I will let you know. So far it passed the first reading and the last meeting of vaadat ksafim was the end of December. What do you think? How do we encourage competition and lower prices? 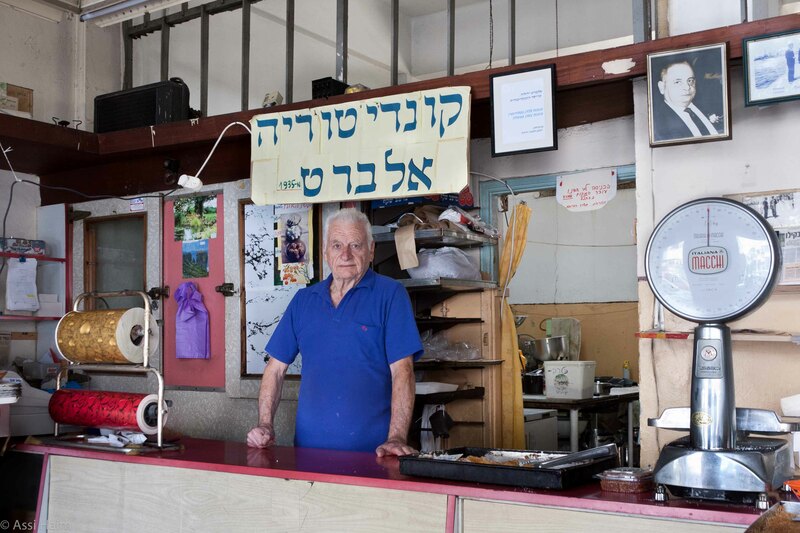 A report came out last week from the Knesset comparing prices in Israel to other OECD countries and analyzes the possible reasons along with debating the necessity for a new law to increase competition in the food industry. There are so many things I would like to share with you from the report, but I will start with the graphs. This shows the real change in the Consumer Price Index from 2005-2013. The US and the EU are at 1.8% whereas Israel is at 16%- the highest of all of the nations. This shows the sales tax percentage on food in 2010. Israel is at 12%, the OECD average is 8.9%. The US, Canada, and the UK are 1% or less. This chart shows what percentage of the market the top three manufacturers control, split into different food groups. The most striking is dairy products, where the top three companies control 90% of the market. Of course since Israel is a small country, it naturally has less manufacturers than the US or EU, for example. This chart shows what percentage of the market each supermarket chain has. 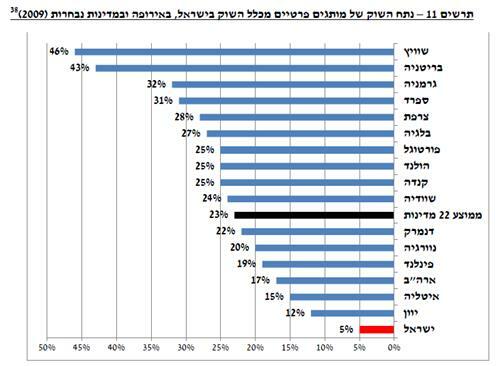 Shufersal is #1 with 34%, Mega has 20%, Rami Levy only 8%, Yaynot Biton 5%, Kimat Chinam 4% and the rest have 29%. The good news is that the hold the two main supermarket chains have on the market has slowly been decreasing since 2007- from 69% to 56%. This shows the five main food companies in Israel (Strauss, Osem, Tnuva, Unilever and The Central Organization for Soft Drinks) and what brands are theirs. This chart shows the percentage of the market held by private brands in 2009. 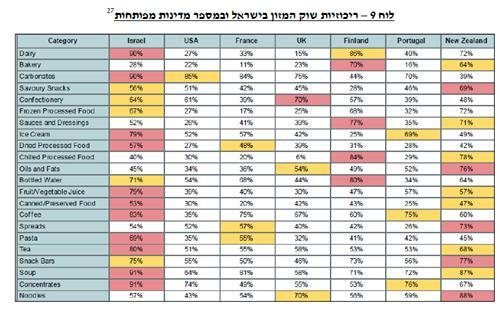 Israel is at the bottom with 5% and the average is 23%. Of course, the manufacturers have expenses as well. 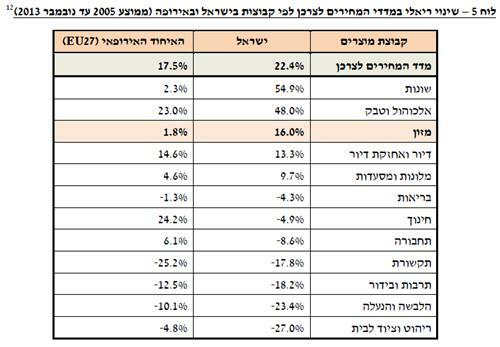 The top chart shows that the price of electricity went up 36% for Israeli manufacturers as compared to 63% for the EU. The middle chart shows that the price of workers went up the same in the EU as in Israel. 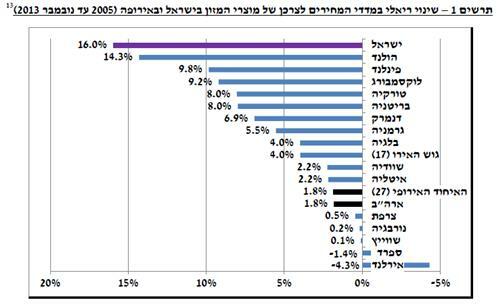 The bottom chart shows that Israeli manufacturers pay a much higher amount for property tax than other OECD countries- 84.7 thousand shekels as compared to the average 38 thousand shekels. This chart, however, was the big shocker. Here we see the difference between the EU and Israel regarding food- in Israel prices jumped 16% since 2005 and the EU jumped 1.8%. The first group, however, innocently called “miscellaneous” jumped 54.9% for Israelis and 2.3% for Europeans. What is included in that group? cigarettes/tobacco, toiletries and cosmetics, jewelry, bags and office supplies, infant products and legal services. 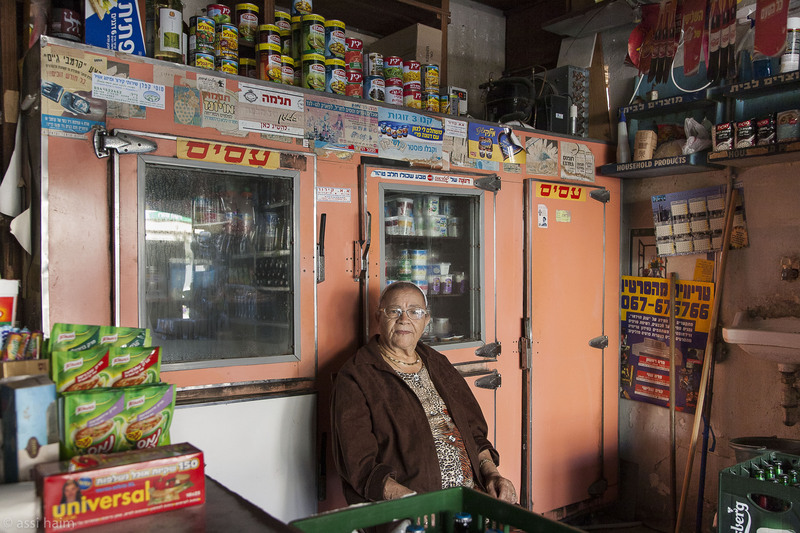 Where has Israel succeeded in lowering prices? Education went down 4.9% in Israel and went up 24.2% in the EU. Transportation went down as well by 8.6% whereas in the EU it went up by 6.1%. In my next post I will talk about the proposed new law and what the committee’s recommendations were. If you are looking for that special gift in Duty Free, the rabbanut has announced that all Johnnie Walker whiskies (Red, Blue, Black, Double Black, Green, Platinum and Gold Reserve) imported by IBBL Spirits and with an OK on the original label is kosher with no suspicion of chadash. It is chametz and pareve. For the original OK listing, click here. For the complete listing of all alcoholic beverages the rabbanut permits to be imported into Israel, click here. Johnnie Walker is on page 141. The ID number is 18362. Be aware that other companies may import non-kosher versions. Make sure that it has the OK and is imported by IBBL. Two free containers of Daniella – expires tomorrow! Machsanei Lahav and Strauss have posted a voucher on Big Deal for 2 free containers of Daniella at all Machsanei Lahav stores. The voucher is good now until 28 Feb 2014. One voucher per customer. If you never tried Daniella, it is whipped gevina levana like Yoplait’s Shtuzim. My kids love the banana flavor and hate the strawberry one, but try it for yourselves. For a list of Machsanei Lahav stores, click here. In case you missed the notice, on Feb 24 there will be a national defense exercise in all schools and ganim in Israel. The following is the translation of a letter that my children received in school. The education system and the Home Front Command annually conduct a self-defense drill in all the schools in the country. This drill is the high point of the educational institution preparing for various emergency situations. This year the drill will take place on Monday, February 24th 2014, in all the schools, nurseries and kindergartens. The drill in the educational institutions will be carried out this year in the form of rockets and missiles being fired while the children are in their classrooms; as part of the preparations for the national plan of implementing lessons from the education system for emergency situations. Education about how to react in emergencies is important and significant in preparing the population of Israeli society during various emergencies. Performing the drill according to the guidelines of the senior department of security at the ministry of education and the rules of conduct in emergency situations, it will increase your safety as well as your children’s safety, and ensure the optimal performance required in an emergency. The success of the drill lies in the full cooperation of your children and your assistance. Please talk to your children about the exercise, so they understand and internalize the importance of the preparation routine in emergency situations. We will do everything so the drill will help the children’s sense of control and strengthen their abilities in emergencies. Coping in emergencies is dependent on preparation and organization; therefore the preparation of the educational institution and the families is extremely significant. Those who are prepared in advance will deal better and more efficiently in emergency situations. Preparation and practice drills – are the key to coping correctly in an emergency! By the way, if you never heard of Anglo Protekzia, this is a great service that helps you get the lowest prices from your service providers. It always helps to have someone doing the yelling and negotiating for you to help you save money. If your bills seem too high, you might want to check them out.